free streaming video, free video streaming app, video streaming software, streaming video to iPhone, streaming video to iPad, streaming video to AndroiiPad, iPod touch and Android via WiFi, 3G or 4G network. Consist of Air Playit App Client and Air Playit server, it play video audio in real time. 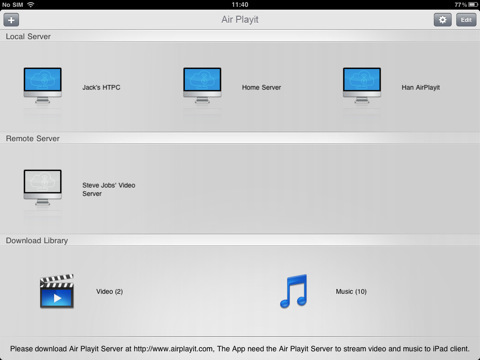 Air Playit, consist of Air Playit Server and app client, is a free video streaming software. It supports remote streaming almost any auido & video stored on PC/Mac to iPhone, iPad, iPod touch, and Android via WiFi 3G 4G network, acts as your personal clould server & player and let you watch videos on the go.